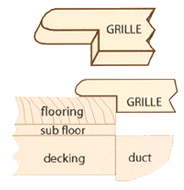 Self Rim grilles are the preferred style for most flooring surfaces. The grille simply drops into a hole cut in the finished flooring. This versatile style can be used with new or existing hardwood floors, laminate, carpet, tile, or vinyl, with the rim of the grille neatly concealing the cut edge of the finish flooring. Each grille is 3/4" thick with a bull nosed rim that is 1" wide by 3/8" thick. Blades can run long direction, straight or angled, or short direction for 2-way or 3-way diffusion. These supply air vents are also available in 1" x 1.5" on center rectangles, 1" x 1" on center squares, and 1.5" x 1.5" on center squares. Custom thicknesses and sizes available upon request.